Photo Release -- Northrop Grumman-Built Aegis Guided Missile Destroyer William P. Lawrence (DDG 110) Completes Successful "Super Trial"
PASCAGOULA, Miss., Jan. 25, 2011 -- Northrop Grumman Corporation's (NYSE:NOC) Aegis guided missile destroyer William P. Lawrence (DDG 110) successfully completed her combined super trial last week in the Gulf of Mexico. The successful sea trial paved the way for delivery to the Navy in the next six weeks. The company's 28 th destroyer is being built in Pascagoula. "I want to thank our shipbuilder and Navy team for a very professional effort culminating in an outstanding acceptance trial," said Richard Schenk, test and trials vice president, Northrop Grumman Shipbuilding. "This is the last DDG to be delivered for a while and this team has set the bar very high. As a result of all our successful demonstrations and events, we are flying three brooms to signify your achievement. Thank you for your professionalism and teamwork." "I'd like to congratulate the team for a very successful acceptance trial," said U.S. Navy Capt. Bill Galinis, supervisor of shipbuilding, Gulf Coast. "This team conducted over 180 demonstrations and tests over the last week with the Board of Inspection and Survey, with all major events conducted safely and very successfully. I'm very proud of this team on the William P. Lawrence DDG 110 and the effort you put forth during the construction, test and leading to the delivery of this fine ship. Your performance on all the major events leading up to this day have been nothing short of tremendous. Each member of the Northrop Grumman and Navy team should walk offÂ the ship with heads held high and feeling very proud because you have done an extremely tremendous job and the Navy is getting a very good ship." 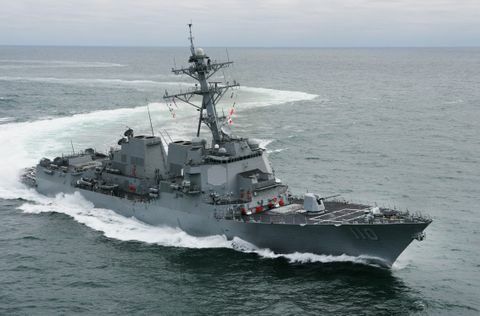 "Sea trials were excellent and they confirmed what I have been watching over the past 20 months," said U.S. Navy Cmdr. Tom Williams, prospective commanding officer, DDG 110. "The Northrop Grumman shipbuilding team has produced an outstanding ship. The engineering plant will make sure we can sail fast and the weapons trial demonstrated that we can hit the enemy hard. My crew is ready to come aboard and demonstrate that our motto will be 'Never Give In.' I am very proud of this ship and that it will live up to the legacy of Admiral William P. Lawrence. The shipbuilders should be very proud of what they did here, too." During the trial, Northrop Grumman and the U.S. Navy's Board of Inspection and Survey (INSURV) tested the ship's weapons, communications and propulsion systems and conducted several other inspections including habitability, water purification and food preparation. "I want to congratulate the shipbuilders from Northrop Grumman and supervisor of shipbuilding, Gulf Coast for an outstanding super trial," said Northrop Grumman's DDG 51 program manager George Nungesser. "This ship has a special significance as it is our 28 th destroyer and final DDG 51 Flight IIA ship currently under contract. We expect our success in the development, construction, testing and delivery of surface combatants to continue for years to come." Cmdr. Williams is the ship's first commanding officer and will lead a crew of 276 officers and sailors. The 509-foot, 9,200-ton William P. Lawrence has an overall beam of 59 feet and a navigational draft of 31 feet. Four gas-turbine propulsion plants will power the ship to speeds above 30 knots. DDG 110 honors the late Vice Adm. William P. Lawrence, who spent nearly six years as a prisoner of war in North Vietnam. He later served as superintendent of the U.S. Naval Academy. DDG 110's sponsors are Diane Wilcox Lawrence, widow of Vice Adm. Lawrence, and Vice Adm. Lawrence's daughters, Laurie Macpherson Lawrence and retired U.S. Navy Capt. Wendy B. Lawrence, also a former NASA astronaut. This highly capable multi-mission ship can conduct a variety of operations, from peacetime presence and crisis management to sea control and power projection, all in support of the United States' military strategy. William P. Lawrence will be capable of simultaneously fighting air, surface and subsurface battles. The ship contains a myriad of offensive and defensive weapons designed to support maritime defense needs well into the 21st century.